Dixie Chopper is excited to introduce the Pursuit Walk-Behind into our 2015 product lineup. The Pursuit Walk-Behind comes equipped with an 18 hp Briggs & Stratton engine and 32-, 36- and 44-in. deck size options. 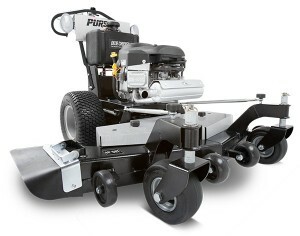 The Pursuit’s narrow deck sizes are perfect for commercial cutters that have to mow around tight areas. With dual drive, the Pursuit offers zero-turn maneuverability on select models. Never let the sun restrict how much mowing you get done, with the light kit equipped on dual drive models. The Pursuit Walk-Behind is the perfect addition to any commercial contractor’s fleet. 1 Comment on "Dixie Chopper Pursuit Walk-Behind"
Great decision to produce this mower! This is the same mower design Better outdoor Products produced. They went out of business when the economy tanked. This mower is light (around 330 lbs.) and only 66 inches in length. I’ve used the BOP mower for 7 years…best mower I have ever owned. I will purchase the Dixie Chopper when I need a new one.